Is there another participant you'd prefer to sit with? Have you been to an Anita Goodesign before? Have you been to an Allbrands Event before? Dietary restrictions or other needs? Availability Advance Orders Only. Please review the product description for complete details. Don't miss your chance to be a part of our 2 Day Hands-on In-the-Hoop, Next Level Embroidery 301 Party! Featuring Anita Goodesign! 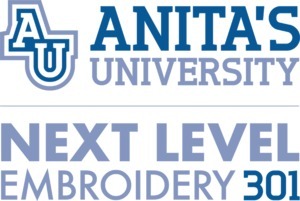 We are excited to announce the newest class offering to hit the Anita’s University campus, Next Level Embroidery 301! 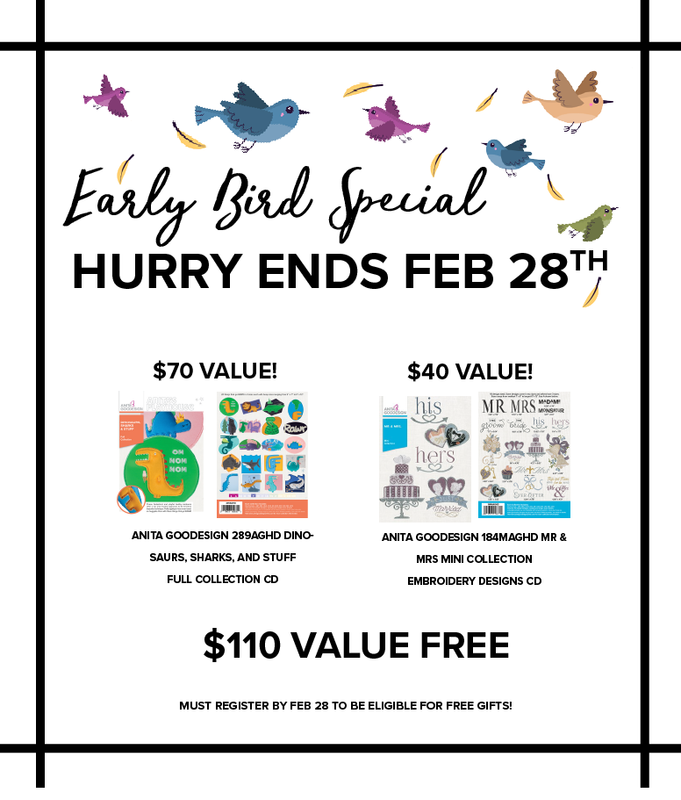 Whether you have attended our prior 101 or 201 classes from Anita’s University, or if this is your first time joining us, you’ll be amazed at the new things that you will learn! During the 301 class we are going to explore many different embroidery techniques — such as heirloom stitching, free standing lace, and coloring your embroidery project. We’ll take a closer look at unique appliqué methods such as watercolor appliqué, reverse appliqué, ghost stitch appliqué and so many more. Thinking outside the hoop, we’ll visit dimensional designs through button-up embroidery and our reverse trapunto method. This is only the beginning of the education you’ll receive, and we can’t even describe how much fun you’ll have! That's over $500 In Extras! 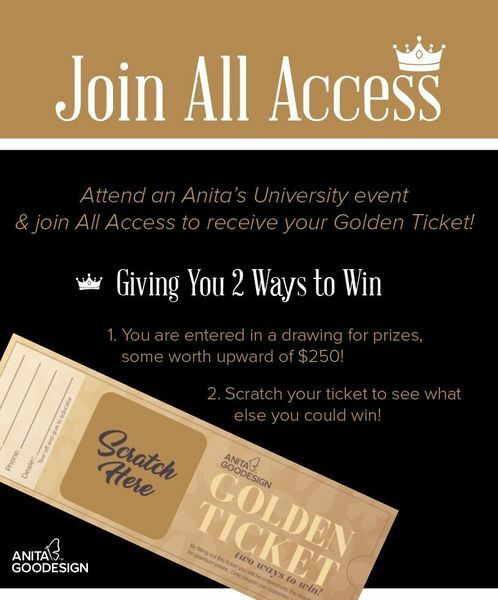 Join All Access to receive your Golden Ticket. When Jenn is not traveling the Country teaching Anita Goodesign events, she is the Creative Director for Anita Goodesign. Jenn is responsible for picking out the gorgeous fabrics and colors in the designs that you see. 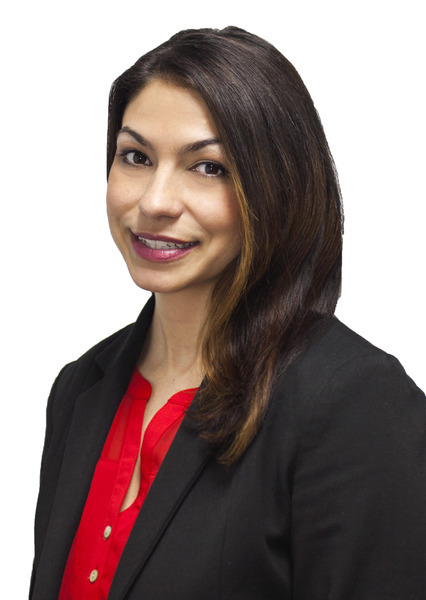 Jenn is outgoing and energetic, and we are so excited to have her host! 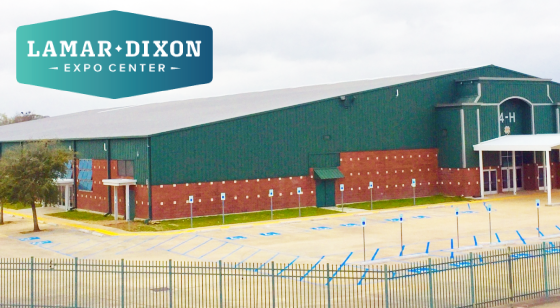 I especially enjoy going into the location in Slidell. Jennifer is super at sharing information, new product availability and providing a great learning experience. I'd like to see better descriptions of items on web site. I'm currently in the market for better lighting Thank you. Have you been to one of our Anita Goodesign events?